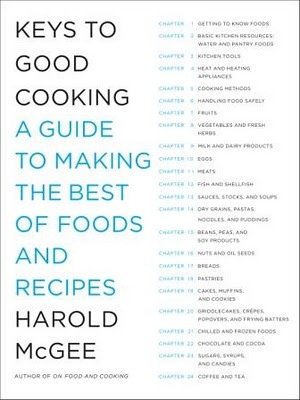 A few weeks ago, I posted about a new cookbook by the esteemed Harold McGee. 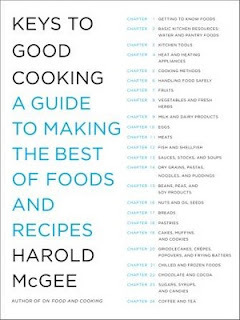 The Keys to Good Cooking is much more than a cookbook; it's a guide, a companion, a troubleshooter, a friend. If you've ever asked Why? or How? in the kitchen, than this book will be your kitchen goddess. With Thanksgiving just two weeks away, I need it more than ever. There's a subsection on oven roasting, advice on rubbing the bird with butter, tips about obtaining crisp skin and moist meat. Armed with information, I think I'll be making a masterpiece turkey this year. And if I err (which I'm destined to do), I'll head back to the book for troubleshooting. And we're not just talking turkey either, folks. There's a whole section on pies and pastries (not to mention vegetables, breads, sauces, eggs, etc). Want to avoid a soggy crust under your pumpkin pie? McGee says to use a pastry crust made with egg. Yes, sir! They say there are no dumb questions, and the advice in the book ranges from obvious to brilliant-but always accessible. It's a lovely stoveside companion for both a beginning cook or an accomplished chef. I'm relieved to have it in my turkey-day arsenal. Let's start talking about Thanksgiving tomorrow. See you then. PS I was not paid or compensated in anyway for this review, other than receiving a copy of the book. As always, my opinionated opinions belong to bossy old me. I think the book sounds brillant, and just what I need. Maybe another great Christmas gift to add to my list????? I can't wait for you to talk Thanksgiving. Pumpkin! Turkey! Stuffing! Gravy!! Apple Cider! This book sounds so interesting and helpful. Thanks for the recommendation Prudy! Thanks for sharing this. There are so many tricks to good cooking. After all, a lot of how different ingredients relate together is partially about taste - but it's also about chemistry. Did you know if you put yogurt in your bread recipes it gives the yeast something to build on and makes it rise better? I love little factoids like that - and sharing 'em on my blog sometimes as well. That's a great tip! I've used yogurt as a base for a sourdough starter and I've used buttermilk in bread dough, but I've never just put in yogurt to help my yeast. I really needed that tip since my yeast is always sluggish in my cold kitchen during the winter. Thank you, thank you! Prudelicious, it's finally a Friday and my girlfriend is out of town! I've missed you. I hope your trip was fun. This book sounds amazing! You can almost substitute any word you want with ' Cooking'. "The Keys to Good _____". A guide, friend, companion....kitchen goddess? Sign me up! I've heard many ways to do it, but never 'rubbing the bird with butter'. Prudelicious, not only do I have spelling and mental problems, but now computer!!! I think my girlfriends lousy kids messed it up. I'm intrigued. I love a good cooking reference book. I'm adding it to my Christmas list! Looking forward to Prudy's Thanksgiving (alas, it will only be a virtual feast:). I'm hosting this year and although I have done the same turkey for several years (brined in apple cider), I am open and ready for new suggestions. So bring it! I just checked the local library and they have it on order. I'm first in line to read it. Yay!! Ooh, this would be a PERFECT thing to help with a great Thanksgiving dinner - good point! Sounds like a good resource for any kitchen.